After serving approximately 9 years in the United States Air Force as a Communications officer, Virgil transferred to the California Air National Guard, moving to San Diego, CA. He immediately began clerking for his brother Brooks’ law firm, Shaffman, Iler, Palkowitz and Doft and attended Western State University College of Law (now Thomas Jefferson School of Law), participating in their part-time night law school program. Upon graduation in 1991 from Western State University College of Law, Virgil became an attorney in 1992 and stayed on with Shaffman, Iler, Palkowitz and Doft as an associate attorney. In 1994, Virgil was selected as the commander of the 147th Combat Communications, San Diego, and shortly thereafter re-entered active duty military status for approximately two years. He later returned to reserve status, while still performing his commanding duties for the 147th, but returning to his full-time law practice with his brother Brooks. 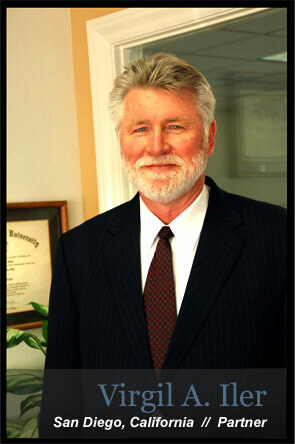 Iler & Iler, LLP was formed in 1997 in the Rancho Bernardo area of San Diego. Virgil retired from the California Air National Guard in 2002. In addition to litigating and trying civil cases, Virgil also has extensive experience representing clients in obtaining disability benefits through the Social Security Administration as well as through private and group insurance policies.